The BBC Symphony Orchestra has played a central role at the heart of British musical life since it was founded in 1930. It provides the backbone of the BBC Proms, performing around a dozen concerts in the festival each year. Highlights of the 2015 Proms season include celebrations of Sibelius and Nielsen in their 150th anniversary years and the First and Last Nights, conducted by Sakari Oramo and Marin Alsop respectively. The BBC SO has a strong commitment to 20th-century and contemporary music, with recent performances including commissions and premieres from Unsuk Chin, Brett Dean, Wolfgang Rihm, Christopher Rouse, Albert Schnelzer and Ryan Wigglesworth. 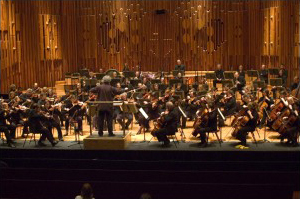 It performs an annual season of concerts at the Barbican, where it is Associate Orchestra. The 2015-16 season includes six concerts conducted by Chief Conductor Sakari Oramo including symphonies by Mahler and Elgar, Total Immersion days devoted to the music of Henri Dutilleux, Henryk Górecki and Louis Andriessen (including Andriessen’s opera La commedia), and the rarely-performed operas by Leoncavallo and Bellini. The BBC Symphony Orchestra also works regularly with Semyon Bychkov, who holds the Günter Wand Conducting Chair, and Conductors Laureate Sir Andrew Davis and Jiří Bělohlávek. Brett Dean is the orchestra’s Artist in Association. Central to the orchestra’s life are studio recordings for BBC Radio 3 at its Maida Vale home, some of which are free for the public to attend and the BBC SO also performs throughout the world. The vast majority of concerts are broadcast on BBC Radio 3, streamed online and available for 30 days after broadcast via BBC iPlayer. The BBC SO is committed to innovative education work and ongoing projects include the BBC’s Ten Pieces, BBC SO Plus Family scheme, which introduces families to classical music with pre-concert workshops and discounted tickets, and the BBC SO Family Orchestra and Chorus.